FILE- This Jan. 20, 2012, photo, taken in New Mexico's Bootheel region shows part of the Diamond A Ranch and is 77 miles from the nearest border patrol station. A Guatemalan girl, 7, died after her father and other migrants were picked up along the remote stretch of the border. The death of a 7-year-old Guatemalan girl while in U.S. custody on the Southwest border last week is raising questions about when and how border officials handled not only her symptoms and treatment, but the subsequent delayed disclosure of her death to the public, the media and Congress. On Friday, the investigation into the death of Jakelin Caal Maquin escalated, with the Office of the Inspector General for the Department of Homeland Security (DHS) saying it would be looking into how the agency, which oversees U.S. Customs and Border Protection (CBP), acted during the approximately 27 hours from the time the girl was taken into custody until she died. CBP on Friday also confirmed the girl's name as Jakelin Caal Maquin. An earlier report by the Associated Press misspelled the girl's first name. Jakelin crossed into the U.S. with her 29-year-old father, Nery Caal, after traveling from Raxruha in Alta Verapaz, northern Guatemala. U.S. Customs and Border Protection agents detained the pair late on Dec. 6, as part of a group of 163 border-crossers held in a remote area of southern New Mexico, near the Antelope Wells Port of Entry, according to CBP and DHS accounts. A quick evaluation of the girl did not raise any concerns about her well-being, according to the agencies. But by the next morning, Jakelin was in distress. She died shortly after midnight on Dec. 8. The initial indication from Providence Children's Hospital in El Paso, Texas, where she was taken, is that she died from septic shock. Her father was with her, CBP said. "After completing a dayslong, dangerous journey through remote and barren terrain, the child, who, according to the father, had not been able to consume water or food for days, began vomiting, went into sepsis shock and after receiving emergency treatment from U.S. Border Patrol Emergency Response Technicians (EMTs), air paramedics and emergency room personnel, died," according to a DHS statement. FILE - In this Jan. 4, 2016, file photo, a U.S. Border Patrol agent patrols Sunland Park along the U.S.-Mexico border next to Ciudad Juarez. CBP said it will investigate the death. During a call with reporters on Friday, a CBP official repeated what DHS Secretary Kirstjen Nielsen also said in a statement overnight: that the journey is dangerous, and the family "chose to cross ... illegally." "Sometimes aliens do die in the desert," the CBP official, who declined to be named, told reporters. However, Jakelin didn't die in the desert; she died in CBP custody. A Guatemalan official told Univision that the autopsy has not yet been done, meaning no cause of death has been determined. Among the questions for CBP is the potential language barrier between the girl's father and border officials, who said they provided Spanish-language assistance to the group. Tekandi Paniagua Flores, the Guatemalan consul in Del Rio, Texas, told Univision they have been in touch with the girl's father. He said the man speaks Ke'chi, also called Q'eqchi', a Mayan language spoken by about 800,000 people in parts of Guatemala and Belize. The consulate provided services to him in his native language. The CBP official told reporters on Friday that the father was asked questions in Spanish in order to fill out a form in English. There was no mention of an interpreter for Q'eqchi'. DHS and CBP, in response to a VOA inquiry regarding the potential language barrier, provided a statement that did not address the language question but noted the start of the inspector general's investigation. In the statement, CBP also said it is reviewing its "notification policies on deaths to the public and Congress" amid questions about why the agency did not disclose Jakelin's death until a Washington Post story was published this week, and why Commissioner Kevin McAleenan did not mention the girl's death during his congressional testimony before the Senate Judiciary Committee on Dec. 11. Deaths in CBP custody are rare, according to the agency's last report to Congress, as mandated by law, which included data for fiscal 2015. That year, the report said 10 people died as a result of use of force by CBP officials. Additionally, one person who died while in custody had a pre-existing medical condition, another committed suicide in a CBP holding facility, and a third died from heatstroke after being apprehended by CBP agents. VOA requested updated information from DHS and CBP about the number of deaths in CBP custody for the past three years. DHS assistant press secretary Katie Waldman responded with the number of rescues Border Protection officials have performed in the last year, but did not include the number of deaths in custody. A follow-up email regarding the questions about deaths in CBP custody went unanswered. 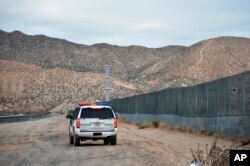 CBP does find bodies while patrolling the Southwest border. The agency maintains data of "Southwest Border Deaths by Fiscal Year" on its website. However, it is unclear if that number includes deaths in custody or only bodies found along the border by CBP officials. DHS and CBP did not respond Friday to a request to clarify that data. In fiscal 2017, CBP documented 294 border deaths. That figure peaked in fiscal 2005 with 492, and more recently in fiscal 2012 with 471, but has hovered between 250 and 350 since then.